As a part of our annual review of the asset that is Traffic Signals in the City of Portland, I was asked to summarize this past year's accomplishments or highlights. This is a public document, so I am reposting the information from the past several years here. § Retimed over 150 traffic signals associated with the implementation of the new Manual of Uniform Traffic Control Devices (MUTCD) standard for accommodating slower pedestrians. This included the retiming of several traffic signals specifically for pedestrians completed by an intern from Portland State University. § Completed the design and construction of several Rapid Flash Beacons to increase pedestrian safety at key TriMet bus stops and other difficult crossings. bike signal for improving school crossing. § Activated new signals at key crossing locations for the bikeways network (SE 87th & Division and SE 122nd & Bush) as a part of the Neighborhood Greenway program. § Prepared operations plan for traffic signals associated with the opening of the Portland Streetcar extension to the Eastside. § Reviewed design plans for the Portland to Milwaukie Light Rail project. § Completing required pole inspections required by the Oregon Public Utilities Commission to identify code violations associated with City facilities. City staff visited over 3,000 poles to identify code violations associated with City-owned overhead cable. § Completed its $1.6 million Innovations Grant by ODOT for SE Powell Boulevard (adaptive signal system) - first integration of transit signal priority and SCATS in the U.S.
§ Completed the rebuild of signalized intersections using a modified standard which resulted in improved safety and lowered maintenance costs for a few particularly problematic locations. § Updated signal technology as a part of the NE 12th Avenue Bicycle Lane project, which resulted in community consensus around the PBOT design concept. 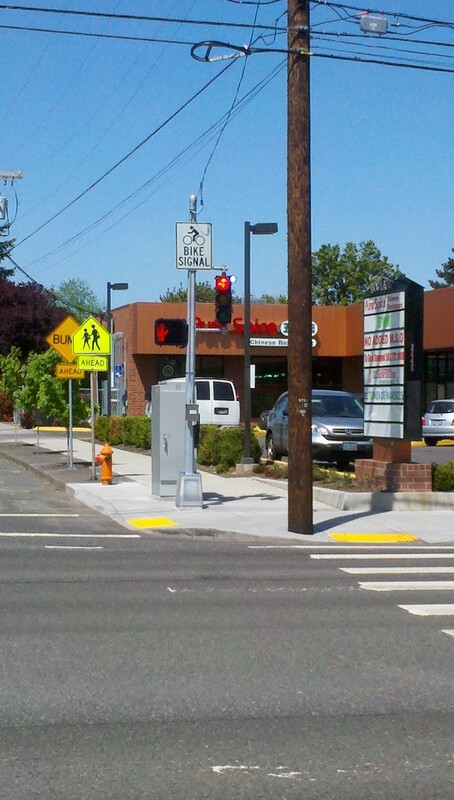 § Implemented new signals associated with the SW Moody Avenue project that serve the new cycletrack. § Continued to work closely with regional partners on improvements to the regional signal system, planning for future improvements that would lead to improved real-time traveler information. § The City was part of a nearly $4M Federal stimulus project that upgraded over 100 signal controllers within the City. § The City was awarded an Innovations Grant by ODOT for SE Powell Boulevard. § ITS America awarded the City with a Smart Solutions Award for the partnership with the Climate Trust to retime signals for carbon credits. § Signals staff completed the rebuild of a signalized intersection using a modified standard. § Completed signals in support of the Eastside Streetcar and Burnside/Couch Couplet. Signal timing and design was acknowledged by the Bicycle Transportation Alliance for contributing to a safer speeds for shared traffic. § Completed Signals in the new Transit Mall.